Switch up your tactics in this stylish action game. 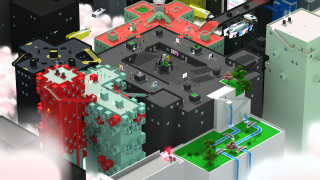 Tokyo 42—SMAC Games' stylish, isometric action game that's a little bit Syndicate, a wee bit GTA1—has a new trailer that better illustrates what its missions will actually entail. You'll be able to tackle its diorama-like environments in a variety of ways, for instance by sneaking into enemy territory and then throwing a grenade into their midst when you get tired of crouching. Unlike in many games, the entire enemy force won't perpetually know where you are if a guard happens to spot you; you can run away, hide and swap outfits and they'll eventually lose your scent. To activate a mid-mission checkpoint, you'll need to first lose the enemy and then physically activate some sort of terminal, giving you a firm base to retry from if you want to re-do a section of the mission using a different approach (or if you want to switch up your tactics going forward, safe in the knowledge that you won't have to restart the entire thing if you die). The other thing I'd point out is that bullets (both yours and the enemy's) move fairly slow here, giving you a chance to dodge them as in a bullet hell shoot-'em-up. I like that, and I like the helpful colour-coding too. Tokyo 42 is, perhaps obviously, set in a futuristic Tokyo, putting you in the role of an assassin in a colourful open-world. There's competitive multiplayer, too.